Education Qualification : Applicants Should Cleared UPSC Engineering Services ESE 2018 Preliminary Exam. Eligible Candidates can Submit IES/ISS Mains Exam Application at the Official Website of UPSC latest by 11th October 2018. 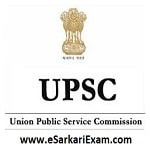 Applicants First Logon to UPSC Online Official Website. Open and Read IES & ISS 2018 Mains DAF Notification Details.